This applies too more than where your business is situated. It is also relates to finding the perfect neighborhood to live in, and often where you will raise your family. Start with a bit of research. Falling in love with a home, and then discovering that the neighborhood is not what you expected, will likely end in disappointment. It is not like buying an appliance or electronics; you can return those if you realize they are not what you perceived them to be. Things you will want to consider as you begin to investigate a new neighborhood of course would be safety, commute, community amenities and home style. Some other essentials you don’t want to sidestep are listed below. This may sound silly, but sidewalks communicate a variety of things about a neighborhood. Sidewalks often lead to parks and other community amenities that are within a short walk. If you or your family is active, this will be important to you. Sidewalks also provide safety for walks to the mailbox, grocery store, local dining or just a neighbor’s house. If you are a pet owner or have children, sidewalks are enormously desirable to keep everyone safe. Some neighborhoods have additional expenses that others may not. It is necessary to consider these additional costs when deciding where to relocate. Private HOA’s can be a bit pricey in planned communities, condos or country club developments. Often there can be more than one HOA, so do a little investigating. You don’t want to receive any surprises after you sign on the dotted line. Rules are a part of HOA’s. Be sure to read through what is allowed and what needs approval. Another noteworthy cost that needs to be understood is how the property taxes are handled. They may in fact be escrowed into your monthly mortgage payments. If and when your property value increases, so will your taxes. This will be reflected in an increase to your monthly payment, so be sure your budget can handle the higher rate. Be aware if you get a fabulous deal on a foreclosed property and you take it because it is within your current budget. Property valuation will increase along with the property taxes. It is something to consider when looking at foreclosures. Neighborhood amenities, most often, are a significant attribute when looking at homes and communities. This is true for families, retired couples or single bachelor living. Fit your neighborhood to your lifestyle and hobbies. For some, like young families, nearby parks or community swimming pools may be of interest. Dog owners may find having a nearby dog park particularly attractive, while senior citizens may enjoy having local social activity centers in their community. Single dwellers may like a variety of convenient restaurants or active nightlife hotspots. Walk or drive around the community to get a feel of what it has to offer. While this concern may only seem to be an issue a family needs to reflect on, this is not exactly true. From preschool through high school, public or private, ratings matter. School ratings affect home values. Schools that are assessed as being strong educational institutions with low drop out rates, high college acceptance scores and other factoring criteria raise property values. For parents this is deemed extremely important to give their children the edge they will need to reach their full potential. For people without children, it needs to be considered for resale value when it is time to sell. It is also something to examine if you are single and/or renting. Rent values will be pricier in neighborhoods with high rated schools. As a parent, be sure to do a bit of first hand investigation to fully grasp the strength of a school district. Do not simply rely on what you find on the Web. Attend a PTA or PTO meeting. It is also beneficial to visit schools, schedule a tour and talk to parents. This investigation will give a clearer picture of what to expect. Bottom line–housing the ideal neighborhood for you or you and your family takes some groundwork. Be patient and find the best fit, it will prove to be advantageous on all accounts. When it comes to picking paint colors for your home, it can be at the very least, a bit daunting. There are many color palette help sites, but my favorite is the one I found at letschipit.com. Chip It! by Sherwin-Williams is a completely user-friendly color pallet creator. You simply upload an image or URL and click Chip It! You are presented with a color palette taken directly from the image you just uploaded. It is easy to edit the colors and mix and match your favorites. There is also a share button so you can show others your creations if you like. If you decide to make an account, the site will save all the palettes you create to look at whenever you login. Choose a favorite vacation shot, something you like on the web or any other image and Chip It! Real Estate Jargon-What Does it Mean? This is the average time a property has been on the market (for sale). Residential Property Data measures this as the time from date of listing to date of sold contract. Buyers can use these data to negotiate the price down on a home sale if the number is high. Sellers, on the other hand, may try to use the data to stay firm on their price if properties in the area are selling quickly. A price a home sales at verses the price it was originally listed and advertised for is expressed as a percentage. The smaller the percentage, the better advantage for the seller to negotiate a firm price. A higher percentage may mean they will loose that negotiating power and may have to consider lowering their price in order to sell. A CMA compares the prices of homes sold, homes currently on the market and homes pending to a subject property. A CMA may be prepared for a buyer or a seller to determine market value. The CMA accounts for style, size, location and other factors that make the homes comparable. The earnest money deposit is a deposit made by the potential home buyer to show that he or she is serious about buying the house. This is typically made at the time of the offer to purchase. A short sale is when the seller arranges with their mortgage lender to accept a price that is less than the amount they owe on the property. The lender typically agrees to forgive the rest of the loan. A short sale arrangement is made between the seller and the mortgage lender. A contingency is a provision of an agreement that keeps the agreement from being fully legally binding until a certain condition is met. Common contingencies are a buyer’s contractual right to obtain a professional home inspection before purchasing the home or obtain mortgage financing. The mission to build strong healthy homes and communities is the mission and vision of EHHAF and its non-profit affiliate VSA (Virtual Sports Academy) — a huge advocate for the fight against childhood obesity. The book evolved out of a local spanish language TV show that the three authors hosted to showcase Latin American recipes and make them healthier. Each brought a unique perspective on Latin American food. Maya, the host, is Peruvian, Martin, the chef, is Mexican, and Malena, the nutritionist is Panamanian. Her approach to nutrition is to “eat better simply.” In this regard, part of what Malena does is recipe development – making traditional Latin American foods healthier by reducing the proportion of meat or adding more vegetables. Furthermore she adapts the recipes to ingredients that are available in the United States to make the recipes accessible. Malena is a very active member of our community and has an impressive resume. She is a part time professor at Metro State, a contributor to several spanish language publications like AARP in spanish, Viva Colorado, and Live Well Colorado. Additionally, she has made numerous radio and TV appearances. For six years she was spokesperson for the American Academy of Nutrition and Diabetes. She has her own website and is active on facebook and twitter where she posts recipes in both Spanish and English. Her cook book, “Maya’s Secrets: 100 Delightful Latin Dishes for a Healthier You” is the winner of both the International Cookbooks 2013 USA Best Books Award and the Living Now Book Award – 2013 Gold Medal Winner. In her free time she enjoys spending time with her family and hiking. Please join EHHAF in thanking Malena for her service by sharing this Highlight on Facebook, Twitter, and/or via email. Thank you for you community involvement, Malena! You are an everyday hero. Buying a home? Property taxes are important to consider when buying a new home, especially if you’re a first-time buyer. Despite living in an age of information, information about property tax by state can be hard to find. We’ve made it simple. Below is a list of property tax by state, based on Household Value (HV). This information is provided by the U.S. Census Bureau, and should be considered when you buy a home. Testimonial: Thank You For Everything! If you’re new to home buying and the mortgage process, you probably aren’t familiar with closing costs. Closing on your first home should be exciting, but without the right knowledge set, it can be scary. We’re here to help, and explain what closing costs are. By the end of this article, we hope you are not asking “What Are Closing Costs?” because you will already have the answers. Closing costs are costs in addition to the price of your home. These can include real estate broker commission/fees, prepaids (items that are required by the Lender to be paid in advance), loan fees, escrows/impounds/reserves, title charges, closing charges, government filing fees, recording files fees, and other miscellaneous charges. “Attorney (Lawyer) Fees, paid by either or both parties, for the preparation and recording of official documents. The principals and/or lender may each be represented by their own attorney. Typically required by institutional/commercial lenders to ensure documents are prepared correctly. Title Service Cost(s), paid by either party according to the contract but by default seller may pay the majority, for title search, title insurance, and possibly other title services. In some cases the attorney may do the title search or the title service and attorney fees may be combined. Required by institutional/commercial lenders and often by the real estate contract. Recording Fees, paid by either party, charged by a governmental entity for entering an official record of the change of ownership of the property. Required by the government for recording the deed. Document or Transaction Stamps or Taxes, paid by either or both parties depending on location (area of jurisdiction), charged by a governmental entity as an excise tax upon the transaction. Required by law. Survey Fee for a survey of the lot or land and all structures on it, paid by either party, to confirm lot size and dimensions and check for encroachments. Required by institutional/commercial lenders. United States Everyday Housing Hero Assistance Fund provides gift funds that are 100% gifts, no repayment neccesary. So how can you obtain a gift from EHHAF? If you’re a member of one of the Every Day Heroes professions – Teachers, Doctors, Police Officers, Firefighters, and Nurses- who would like to be a homebuyer need only qualify for a mortgage loan. Unlike most gifts, EHHAF is a true gift that never needs to be repaid by you, the builder, or the seller. There is no administrative fee whatsoever charged for using our gift program. You will work with our approved Realtors©and mortgage lenders that are trained to help you in either of our programs. Find out more and apply for gift funds today! “Quality teachers are the pillars of quality education – A human right,” says The UN Educational, Scientific and Culture Organization. We couldn’t agree more. 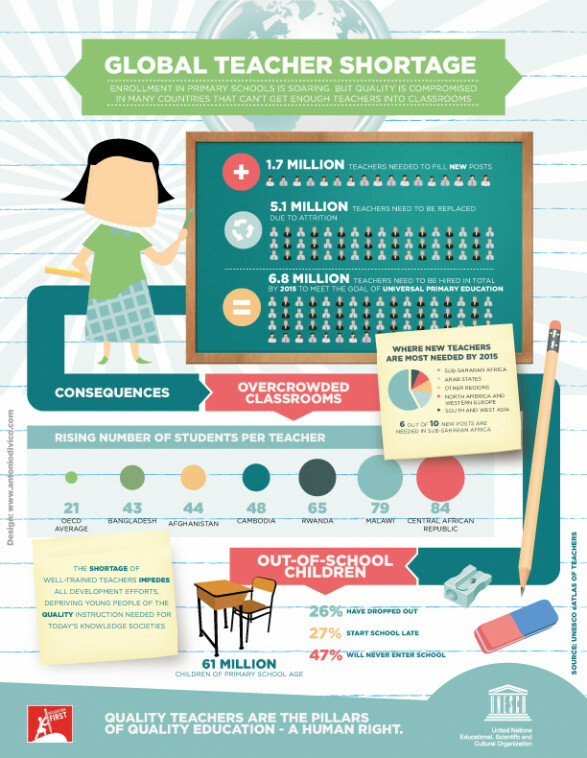 The infographic (below) takes a look at the global teacher shortage. Global Teacher Shortage infographic by antoniodivico. So how do you staff up with incredible teachers? How do we get better teachers into the workforce and into our educational system. The answer to this question is not simple and we’d love to know what you think. We like to think that rewarding teachers is a good start, but only part of the solution. Our Closing Cost Grants for Teachers is a reward that can only begin to express our gratitude for the incredible service of teachers. Sound off in the comment section below and let us know how you think how we can get increasingly better teachers in our education systems! We’d love to know your thoughts and opinions.